The ideal way to start a collection of Airplants. Best value air plants anywhere! Healthy, long lasting and very easy to care for and maintain. Range of colours and shapes for completely unique displays. Perfect for making stunning displays and arrangements or to start your air plant collection. The very best value air plant collection anywhere, this collection of air plants includes a fantastic range of plants guaranteed to help you make a stunning piece of living artwork. Airplants are useful for creating eyecatching displays in and on a variety of surfaces and can be used singly or in groups. They can be put just loose in (dry) vases or other containers. When making into arrangements where several plants are ‘stuck’ together special air plant adhesive is needed or low melt craft glue. Air plants require a small amount of care in the form of weekly misting, or an occasional dunk in water. Rain water is best, but tap water will be ok as long as it is not from a water softener. Air plants grow naturally slowly, but with a bit of TLC and air plant fertiliser they may flower and produce small plants (pups) around the base. The pups can be left to develop naturally where, after a while, a clump of air plants will be produced. If you want to increase your stock of air plants the pups can be removed when they are about half the size of the mother plant, by carefully prising apart. 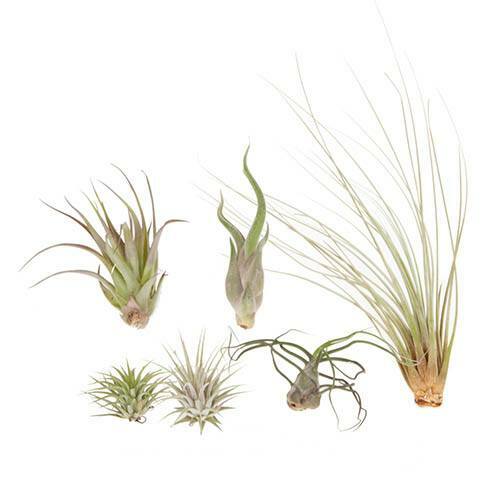 Air plants like good to medium light conditions and do not like harsh direct sunlight. As with most houseplants they do not want to be below 8C. With regular misting and the occasional feed, they can last for years! Supplied as a mixed pack of 6 air plants: 3 small, 2 medium, 1 large. The perfect low-maintenance houseplant, these air plants really do not require much attention at all, making them the perfect choice for adding a bit of life to a room but with very little effort. They grow without soil, so can be mounted or grown in a whole range of containers and supports - but do remember that they are living plants and do require watering, despite their name, they don't thrive on air alone! After unpacking your kit, give your air plant a good soak in a water bath (submerged in the water) for about 20-30 minutes. Shake the plant gently to remove any excess water and leave upside down to dry off on a piece of kitchen paper. Place your plant where it will receive bright, but indirect light. Water at least once a week, preferably twice, by simply submerging in a bath of water (rainwater is best) for 20 minutes or so before draining and leaving to dry. Plants can be misted with a hand sprayer but take care not to make them sit damp as this will cause rot.